A Book Review for You: A book review for The Collector's Guide to Dollhouses and Dollhouse Miniatures 4 Out of 5 stars. 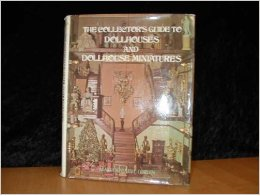 A book review for The Collector's Guide to Dollhouses and Dollhouse Miniatures 4 Out of 5 stars. 213 pages by Hawthorn Books, Inc.
"Lavishly illustrated offers a panorama of miniature houses and all the tiny objects that go in them"
My Review: Here is another book I added to my miniaturist book shelf. Now, this is a book worthy of any miniaturist's bookshelf. It is full of information for those interested in collecting and those of us, like I, that enjoy admiring those that collect, as well of those that build. At over 200 pages, there is a mix of both color and black and white photos for the reader to peruse. The book is broken into three parts: Part I covers Introduction to Dollhouses, Box Rooms and Cabinets, Foldout and Paper Houses, Corrugated Cartonia, and Dollhouse Classics and Masterpieces. Part II covers Dollhouse Miniatures, Decorating with Miniatures: Furniture, Metallics, Ceramic, Porcelain and Glass Miniatures, Art, Accessories and Oddities. Part III covers How to Start a Collection, dealers and Craftsman, etc. Though, a lot of information is a bit dated with the book being published in 1974, the history part is a wealth of information on collecting. If you're a collector of dollhouses and/or dollhouse miniatures, you might want to add this book to your collection.